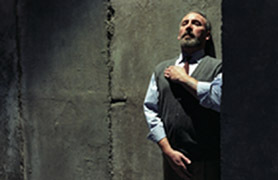 Recounting Auschwitz - a Review of Sir Antony Sher in "Primo"
English actor Sir Antony Sher displays impeccable timing and shows an astute sensibility for recounting personal history in his role as Italian chemist and writer Primo Levi in his one-man show, "Primo," now playing at the Music Box Theatre in Manhattan though Aug. 7. Levi was an Italian Jew whose political views ran counter to those of Nazi Germany. The Gestapo arrested him and shipped him to the Auschwitz concentration camp during the final years of World War II. As a Holocaust survivor, he recounted his experiences at Auschwitz in his 1947 memoir, "If This Is A Man," upon which Sher has based his theatrical adaptation of Levi's imprisonment on Dec. 13, 1943 to his liberation by Russian troops on Jan. 27, 1945. Sher's emotionally detached acting, however, does not effectively communicate the torment of Levi's experiences at Auschwitz. We never really feel Levi's pain and suffering. What the South African-born actor does do remarkably well is convey the rhythms of the Gestapo train as it transports Jewish captives through Austria, Czechoslovakia and the Black Forest into Poland, as well as the rhythmic activities surrounding the prisoners at Auschwitz. His terse grip on the unsettling nature of Levi's writings shows the ways in which the Gestapo gradually stripped away each captive's sense of humanity. First, there is the violation of human modesty because of the absence of toilets. Activity itself later becomes reduced to the passage of time. Eventually, the captives are stripped of their clothes and shaven from head to toe until they stand "naked, shaved and alone." The stage's stark, gray walls and the minimal soundtrack mirror this sense of isolation and underscore Sher's portrayal of Levi's own sense of his barren existence. Stripped of all worldly possessions that even a beggar would enjoy in the outside world, these captives, he tells us, understood the true meaning of an extermination camp. Despite having their identities reduced to numbers on their wrists, these same captives retained their human habits. Their preservation of what few possessions they were able to keep gave them some ability to maintain a sense of humanity. Unhappiness in such a world existed only as a reminder of better things for those captives who once knew the meaning of freedom. Sher's portrait of Levi is rather too detached, narratively speaking, for its own good. He tells the Italian chemist's story from the distant vantage point of the future at a time when Levis was well dressed and matter-of-factly recounting what happened to him years ago. This narrative device makes it difficult for the audience to feel firsthand the harsh reality of Levi's pain. We are left instead with an emotionally flat, though interestingly articulated, portrayal of life in a concentration camp at Auschwitz. Sher does convey the larger community of men, women and children who are not capable of knowing whether their fate will be life or death, but he does not communicate the life of an individual man.